Nikon D600. Nikon D3200. 1 x Protective case (see photos). 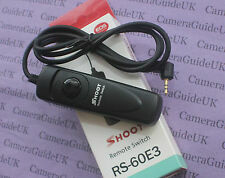 Shutter Release Extension Cable to fit Canon RS-60E3 Remote. 5 metres long lead. These extension cables can be plugged together to make a very long remote release. Simply buy as many as you need and plug them together. The RS-60E3 Remote Release is NOT included. 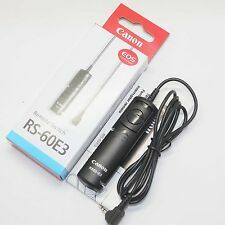 5 out of 5 stars - Shutter Release Extension Cable to fit Canon RS-60E3 Remote. 5 metres long lead. 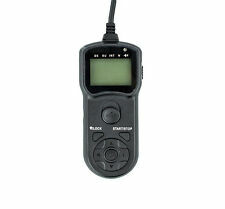 11 product ratings11 product ratings - Shutter Release Extension Cable to fit Canon RS-60E3 Remote. 5 metres long lead. Canon EOS 50D, 40D, 30D, 20D, 20Da, 10D, 7D, 6D, 5D Mark III, 5D Mark II, 5D, 1DX, 1Ds, 1Ds Mark III. The buttons can be operated with a single thumb. The LCD panel can also be illuminated. The remote has a stylish and ergonomic design, making it a pleasure to use. CANON EOS 700D CANON EOS 750D. CANON EOS 70D. Hasselblad H/H1/H2/H2D/H1D Remote Switch Shutter Cord. Samsung GX-20/GX-10 Remote Switch Shutter. If you set it to 10 minutes, for example, one exposure will be taken every 10 minutes until either the film runs out or the Exposure Count limit has been reached. For Nikon D750,D610, D600, D7200, D7100, D7000, D5500, D5300, D5200, D5100, D5000, D3400, D3300, D3200, D3000. 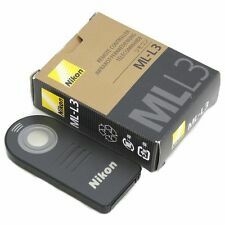 This is a "Must Have " Item for all Nikon Photographers ! Nikon Coolpix P900, 8400, 8800. Nikon D7500 D750 D610 D600 D7200 D7100 D7000 D5600 D5500 D5300 D5200. Nikon D5100 D5000 D3300 D3200 D3100 D90 DF. And, a shutter release button lock is available which for long exposures shooting and continuous shooting helpfully. Nikon Digital SLR D90 D5000 D5100 D5200 D7000 D7100,D3100,D3200 D600 D610. The LCD panel can also be illuminated. The buttons can be operated with a single thumb. If you set it to 10 minutes, for example, one exposure will be taken every 10 minutes until either the film runs out or the Exposure Count limit has been reached. The remote also has a lock for use with bulb mode. SICHER Soft Release Shutter Button for Cameras. Quality Brass. RED Concave. SICHER Soft Release Button. Premium quality soft release button from SICHER. Unlike the cheaper alternatives, SICHER soft release buttons are precision machined from high quality. Concave design for extra comfort. Total Length: 100cm(40"). Shutter may be locked or opened for extended periods. Standard sized thread connector. One hand operation leaving your other hand free. GENUINE NIKON MANUFACTURE. NIKON MC-30 REMOTE RELEASE COMPLETE WITH LOCK. NIKON D5, D4S, D1, D2, D3 SERIES. D100 WITH MB-D100 GRIP, D200, D300, D300S, D500 & D700. D7500 D7200 D7100 D7000. D5600 D5500 D5300 D5200 D5100 D5000. D3300 D3200 D3100. D750 D610 D600 D90 Df. And, a shutter release button lock is available which for long exposures shooting and continuous shooting helpfully. Compatible with:Nikon Digital SLR D90 D5000 D5100 D7000 D3100,D3200 ,D5200,D7100 ,D600. The LCD panel can also be illuminated. The buttons can be operated with a single thumb. If you set it to 10 minutes, for example, one exposure will be taken every 10 minutes until either the film runs out or the Exposure Count limit has been reached. 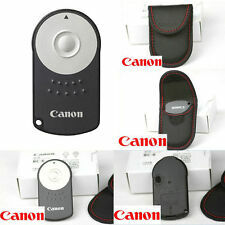 CANON EOS 1000D, 500D, 450D, 400D, 350D, 300D,300V, 50E, 50, 33, 30. Shutter release lock (for long exposures). Colour: black. Cord length: 0.9m(3 feet). For More, Below Link Have a 1 to 5 year warranty program. Nikon D-SLR D850, D500, D810A, D810, D800, D800E, D700, D5, D4s, D4, D300s, D300, D3, D3x, D3s, D200, D2Xs, D2x, D2Hs, D2H, D2, D1, D1h, D1x;. And, a shutter release button lock is available which for long exposures shooting and continuous shooting helpfully. 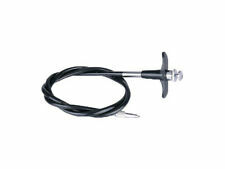 1x Remote Shutter Release Cable Switch for Fujifilm RR-90. Fujifilm X-A1, X-A2, X-A3, X-E2, X-M1, X-T1, X-T2, X-T10. Fujifilm FinePix S1, X100T, X-Q1, X30. 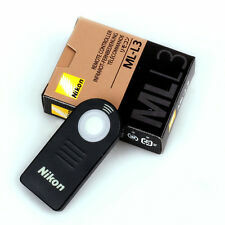 Shutter release button with lock - for long exposures shooting and continuous shooting. Canon EOS 800D, 200D, 760D, 750D, 700D, 650D, 600D, 550D, 500D, 450D, 400D, 350D, 300D. Canon EOS 1300D, 1200D, 1100D, 1000D. Canon EOS 77D, 80D, 70D, 60Da, 60D. Canon EOS M6, M5, EOS R. And, a shutter release button lock is available which for long exposures shooting and Continuous shooting helpfully. 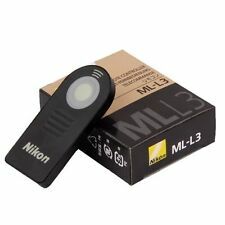 NIKON D3000 D3200 D3300 D3400 NIKON D5000 D5100 D5200 NIKON D40 D40X D50 D60 D70 D70s D80 D90 NIKON D600 D7000 NIKON 1 J1 J2 V1 V2. Canon EOS 5D, 5Ds, 5Ds R, 6D, 7D, 1D. Canon EOS 5D Mark II, 5D Mark III, 5D Mark IV. Canon EOS Canon EOS-1D X Mark II, 1D Mark II, 1D Mark II N, 1D Mark III, EOS-1D Mark IV, 1Ds, 1Ds Mark II, 1Ds Mark III, Canon EOS-1D C, Canon EOS-1D X.
Olympus OM-D E-M1, OM-D E-M5, OM-D E-M5 Mark II, OM-D E-M10. 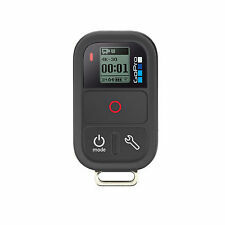 Shutter release button with lock - for long exposures shooting and continuous shooting. Olympus E30, E100, E400, E410, E420, E450, E510, E520, E600, E620. EOS 760D, 750D, 700D, 70D, 650D, 600D, 60D. EOS 550D, 500D, 450D, 400D, 350D, 300D, 100D. EOS 1500D, 1300D, 1200D, 1100D, 1000D. Product model: RW-221/E3. Pixel RW-221/E3 is compatible with Shutter connecting cable E3 type x 1. Suitable for Sony a33/a55/NEX5/a230/a290/a330/a390/a450/a500/a550/a560/a700/a900. Lithium CR2025 battery (included). Canon EOS 760D 750D 700D 650D 600D 550D 500D 450D 350D 300D. 7D 7D Mark II 70D 60D. 5D 5D Mark II 5D Mark III 5D Mark IV. 1x CR2025 Lithium Battery (Pre-installed). 1, Remove the plastic film protector at the bottom of the remote. Sony A7, A7 II, A7R, A7S, A6000, RX100 II, RX100 III, NEX-3N, A3000, A5100, PF175, HX300, A58 Sony Cybershot DSC-RX10, DSC-RX100 II, DSC-RX100 III, DSC-HX300, DSC-HX400 / HX400V, DSC-HX50 / HX50V, DSC-HX60 / HX60V. SONY: A58 NEX-3NL A7 A7II A7S A7R A3000 A5000 A6000 HX300 RX100II HX50 RX100M2 RX100M3 HX400 HX60 etc. (pls check with your connector). The buttons can be operated with a single thumb. The LCD panel can also be illuminated. Press the "2S", then loosen the trigger about two seconds later. How to use?. Size: about 3.4 "x 1.6" x 0.2 "/ 86mm x 40mm x 6mm. 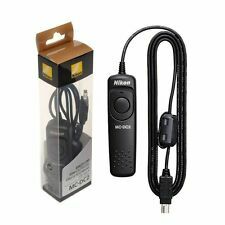 Remote Shutter Release Cable for Olympus OM-D E-M1 MkII. RM-CB2 Compatible. (Last updated November 2017). Really good quality substitute for Olympus's RM-CB2 shutter release cable. Locking function for long exposures. The cable is 90cm long and has a good quality connector.